The Mexican Libertad – one of the most famous bullion coins in the world – commemorates its 35th anniversary in 2017. The jubilee is celebrated with a 1 oz Silver coin integrated in a 2 oz coin bar of pure Silver .999 on which the coin‘s design beautifully continues. En individuell numrering garanterar autenticitet och den strikta begränsningen av endast 5,000 uppsättningar. This is the 6th issue of the successful “The World‘s Most Famous Bullion Coin Bar” Series – ofﬁcially issued by the Bank of Mexico. The anniversary is honored by a double-Dating and the "35" in Proof quality. Baksidan Winged Angel of Mexican Independence Victory Column in front of a landscape with the volcanoes Popocatpetl and Iztaccihuatl and the words "1 ONZA Plata Pura 2017 LEY .999"
3 uns 2017 35-Årsdag av Mexikanska Libertad Mynt Silverstapeln The Mexican Libertad – one of the most famous bullion coins in the world – commemorates its 35th anniversary in 2017. The jubilee is celebrated with a 1 oz Silver coin integrated in a 2 oz coin bar of pure Silver .999 on which the coin‘s design beautifully continues. En individuell numrering garanterar autenticitet och den strikta begränsningen av endast 5,000 uppsättningar. 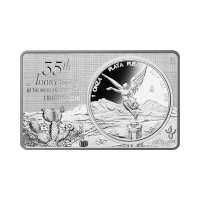 This is the 6th issue of the successful “The World‘s Most Famous Bullion Coin Bar” Series – ofﬁcially issued by the Bank of Mexico. The anniversary is honored by a double-Dating and the "35" in Proof quality.